Flames leap from the Caribbean Petroleum depot in October. (CNN) -- A faulty monitoring system on a gasoline tank at a Puerto Rico storage facility most likely led to a massive fire in October that damaged homes and businesses more than a mile away, federal investigators said Tuesday. A storage tank at the Caribbean Petroleum Corp. facility in Bayamon, near San Juan, was being filled with gasoline from a ship docked in San Juan harbor when the tank apparently overflowed, U.S. Chemical Safety Board investigators said at a news conference. "Gasoline spilled from the tank without detection; as the material spilled, it vaporized and spread across the facility," the agency said in a release. "CSB investigators estimate that the vapor cloud spread to a 2,000-foot diameter until it reached an ignition source in the northwest section of the facility." The liquid level in the tank could not be determined because the facility's computerized monitoring system was not fully operational, the CSB investigators said. To monitor the level in the tank, operators used a mechanical gauge on the tank's exterior wall, the investigators said. As the gasoline level in the tank rose and eventually overflowed, employees in the facility's control room were not aware of the situation. "The filling of a tank without a functioning monitoring system is the type of activity the CSB will be examining very closely," said lead investigator Jeffrey Wanko. "The CSB's investigation will examine operations particular to Caribbean Petroleum, but will also look at the regulations and best practices surrounding the industry as a whole in an effort to improve safety practices at similar facilities." The fire, which started at 12:23 a.m. on October 23, burned for three days. There were no fatalities, but thousands of residents were forced to evacuate to avoid the thick clouds of black smoke. 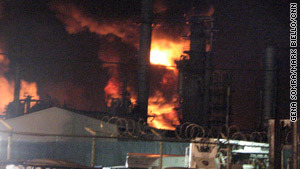 The FBI has determined that the explosion was an industrial accident, said Agent Harry Rodriguez of the San Juan office. "It was not a terrorist act or an act of sabotage," he said. He said the FBI had determined that graffiti found on two San Juan tunnels that referred to a fire were not painted by anyone with connection to the blaze. The spray-painted message on the tunnels, less than three miles apart, said: "Boom, fire, RIP, Gulf, Soul, ACNF." Caribbean Petroleum owns the Gulf Oil brand in Puerto Rico. Nonetheless, Rodriguez said, the FBI and the Bureau of Alcohol, Tobacco, Firearms and Explosives were still investigating. Caribbean Petroleum supplies a significant portion of Puerto Rico's petroleum products. The facility includes a tank farm and refinery that was shut down in 2000. Before the fire, the tank farm stored gasoline, diesel fuel, jet fuel and fuel oil in about 30 aboveground tanks. The Chemical Safety Board is an independent federal agency charged with investigating industrial chemical accidents. CSB investigators look into all aspects of chemical accidents, including physical causes such as equipment failure, as well as inadequacies in regulations, industry standards and safety management systems. The board, which is appointed by the president and confirmed by the Senate, does not issue citations or fines. The board does make safety recommendations to plants, industry organizations, labor groups and regulatory agencies such as the Occupational Safety and Health Administration and the Environmental Protection Agency.